Located at Earlsdon Works, Coventry, Warwickshire, and at 62 Holborn Viaduct, London, in 1898-00. 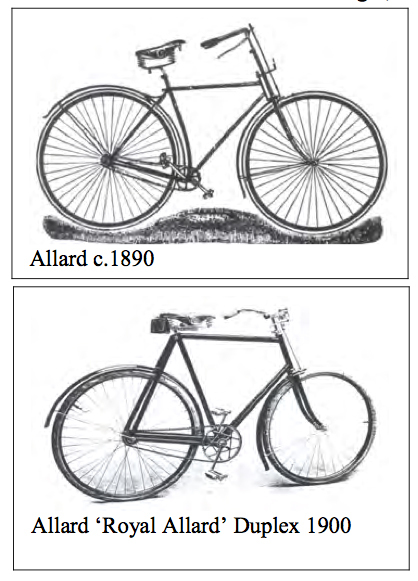 The company was formed in 1890 and by 1900 was known as Allard Cycles & Motors Ltd. G. Pilkington was the Managing Director in 1900 with J. H. Suffield as Financial Manager, W. Williamson as Sales Manager, and Charles J. Band as Company Secretary. Registered numbers 322315, 287257 and 294719. It had a French agent, Albert Boucher in Paris c.1890. Made the ‘Allard’ model 1892-00.